The secret to a perfect athletic performance is not only the daily grueling hours of practice, but also the fuel you put into your body. With that premise, professional athletes Jesse Thomas, Lauren Fleshman, and Stephanie Bruce set out to create the unicorn: a real food energy bar that was nutritionally balanced to support their active lifestyle. After much trial and error (and the untimely death of 10 food mixers), Picky Bars was born. We now have them to thank for creating the best tasting health bars on the planet (really). Community, culture, and personality are at the forefront of the brand and their website needed to be an obvious reflection of that. They sought out It Just Clicked to rebuild it and help give them a rad online presence that matches their equally rad personality. 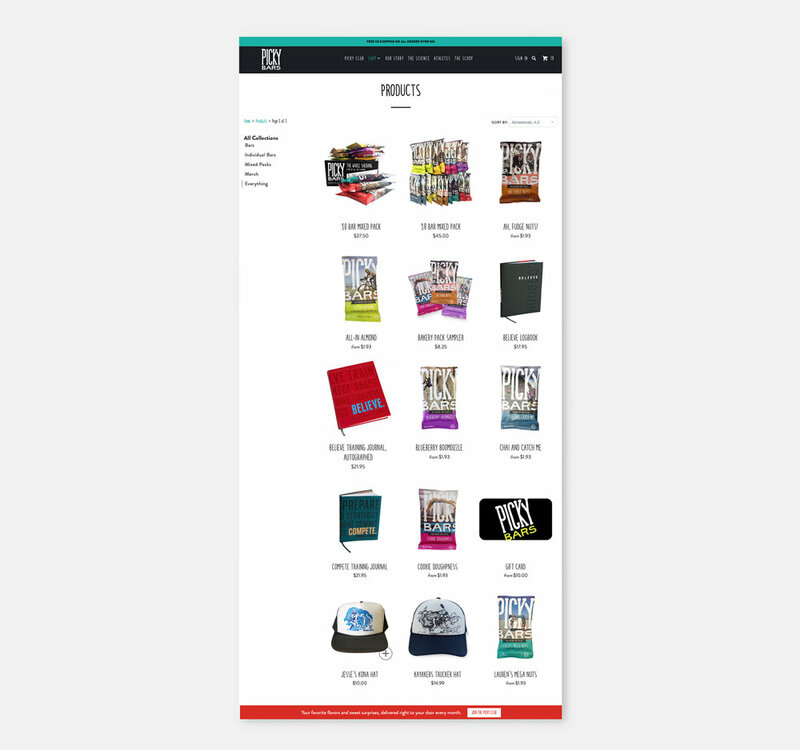 We switched their e-commerce platform from Wordpress' WooCommerce to Shopify to allow for a more sophisticated suite of offerings. Growing companies require a growing systems. Their business relies heavily on their online sales and their highly-interactive social media campaigns and outreach. By posting photos with the hashtag #lifepoints on Instagram, Picky Bar enthusiasts can potentially appear on the wrapper of their favorite bar! The backbone of the business is their Picky Club -- a custom built subscription-based package that welcomes its customers and treats them like family. Join today and you'll never go hungry. Seriously, once you taste one, you'll need a subscription to keep your taste buds happy*. Picky Bars can be found at Whole Foods, REI, Trader Joe's, and various running and specialty sport stores nationwide. We built their Wholesale system to improve these transactions and remove the need for pesky manual orders.